There are the continuous disputes about the role of emails in the business world: alive or dead, effective or counterproductive, replaceable or unexpendable. Meanwhile, despite being discussed and doubted, emails seem to continue ruling the world of business communication: their use is only increasing among companies of all sizes and industries. So, emails are still a crucial part of the way we communicate at work and for the sake of work. At the same time, emails can often be cumbersome and overwhelming. You probably know that stressful feeling when you are bombarded by dozens of new emails, scared to miss something important and waste hours to look through and answer them. Let’s face it: there are many unsolved challenges in today’s business communication. But luckily, there are many ways and tools to keep it productive and organized as well. In this article, we’ve put together the most reliable approaches to avoid plunging into talkative chaos at work. It is generally claimed that team messengers are up-and-coming alternatives to email business communication, and there’s no mystery why they are. The nowadays instant messaging market offers an ocean of options for you to consider. The good news is that the majority of business messengers offer a free trial so you will be able to experience their value (or lack of value) for your company before purchasing. Among the most favored options you can find Flock, Slack and its competitors, Stride, Chanty, Yammer, etc. Being promoted as ‘email killers’, in fact, team messengers haven’t defeated emails. For instance, Slack promised significantly reduce the a number of business emails. And what happened next? Slack sends dozens of various emails to its users, from onboarding to promotional ones. However, its benefits for team productivity, collaboration and communication are significant. The reality is that emails serve a specific area of business communication and are unlikely to disappear anytime soon. Nevertheless, while team messengers may not entirely kill emails, they can be a productive addition to an organization’s workflow. 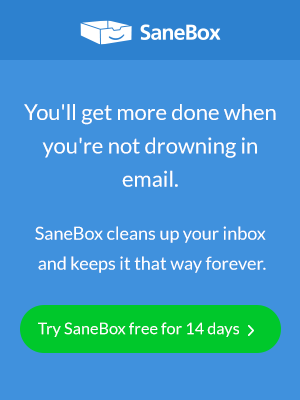 SaneBox, Unroll.me, FollowUpThen, HubSpot Sales, Google Inbox, Sordt, Checker Plus for Gmail, Mailbird and many others. To sum up, the key to running a project in a productive way is to understand when it is necessary to switch to collaboration software project management for more in-depth issues. In other words, online project management tools, in contrast to emails and team messengers, provide a wider, more sophisticated range of features to those who collaborate on complex tasks. Generally speaking, business communication is a complex and diverse phenomenon that should be treated in different ways to stay productive. Need quick as a flash response or real-time brainstorming? Drop a line to your colleague via a team messenger. Want to create a collaborative hub around complex projects? Sure, get started with an online project management tool. Lack order and velocity in your follow-up process? No problem, you are welcome to choose and adopt email management software. In today’s highly competitive business world none of the methods that improve communication and productivity, can be overlooked. It’s not about how to get rid of one or the other communication channels. Therefore don’t swallow the marketing bait of those who convince you to give up emails. It’s all about how to make every business communication channel as productive as possible. And you have all the tools needed to achieve it. Which methods do you employ to streamline business communication at your company? Share your findings in the comments below.